On An Overgrown Path: Is HRTF the key to classical music's future? Is HRTF the key to classical music's future? Why is classical music failing to gain traction with a new audience? Is it because there are not enough women on the podium? Is it because male celebrity conductors are proto-lotharios? Is it because classical music does not attract enough Facebook likes? Or is it because of a growing disconnect between the sonic expectations of the new younger audience and a standard concert hall sound defined by 19th century conventions? There is now a strong case for at least giving serious consideration to the role played by that sonic disconnect. In 2018 the UK video games market reached a value of £3.864 billion ($4.859 billion), making it larger than the combined video home entertainment and music markets. 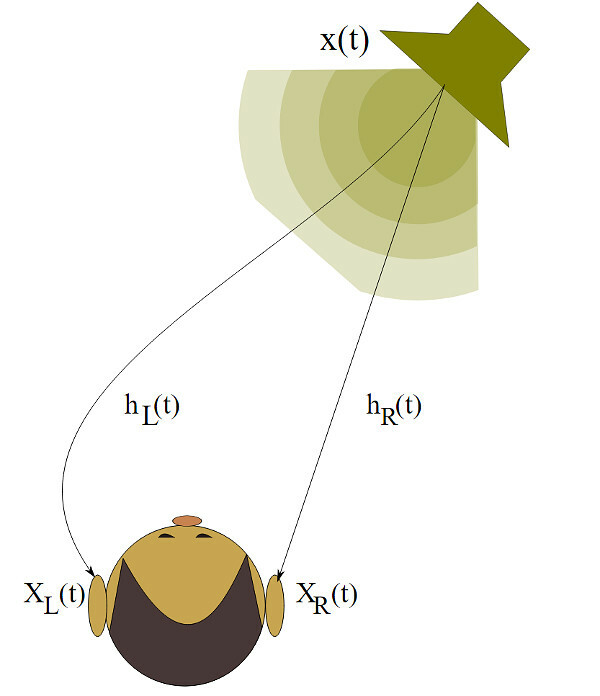 Sound, as well as graphics, is a key component of video games, and spatial sound enabled by digital technologies exploiting the Head-related transfer function (HRTF) is now widely used in games. HRTF is the response function imposed by the anatomical shape of the human ear which modifies how we hear sounds - see header diagram. By synthesizing the HTRF of an ear a two dimensional sound source - either from speakers or headphones - can be transformed into surround sound. Which is what happens in video games with spatial sound. The video games market is overtaking the recorded music market. Which means virtually every potential new classical music audience member will have been conditioned by HRTF spatial sound before they hear a textbook classical stereo balance, yet alone enter a concert hall. The annual Consumer Electronic Show in Las Vegas, which is the biggest tech show in the world, provides important pointers to how digital technologies will reshape home entertainment. One of the standouts at the 2019 CES was Sony's 360 Reality Audio concept technology which takes HRTF one step further by adding a height dimension. The ascendancy of spatial sound has two important implications for classical music. The first is that the new target audience will have sonic expectations considerably at variance with the de facto sonic standard of proscenium arch stereo imposed on classical recordings and concerts. (Some notable exceptions exploiting spatial sound have been covered here in the past: notably Neu Records recordings of Ramón Humet's music and Aeon's of Jonathan Harvey's Quartets.) As the two channel physical media of CD falls by the wayside and streaming and downloading become the norm for music delivery, so the opportunity for spatial and multi-channel sound increases. But the biggest opportunity for HRTF technologies is in the concert hall itself. Any concert hall, whether acoustically 'good' or 'bad', modifies the 'true' sound of an orchestra to a considerable extent. An acoustically 'perfect' traditional hall such as Vienna's Musikverein modifies the sound passively with reflective materials to conform with conventions dating from the 19th century. So using digital technologies to shape concert hall sound to meet changing sonic expectations is not heretical. Because the only 'true' sound of an orchestra is what would be heard if the musicians played in an anechoic chamber where the sound is uncompromisingly and unacceptably dead. But the mantra of classical music is that it does not want digital technologies messing with its concert hall sound. Which is a bit rich coming from an industry with a business model predicated on low-resolution MP3 technology. Although still sneered at by purists, digital sound-shaping solutions by Meyer Audio and others have already proved their worth in the concert environment. Taking digital sound-shaping one step further using HRTF protocols offers huge potential. Remember, digital sound-shaping is a flexible technology that can be used in existing auditoriums without modifying bricks and mortar. So spatially-enhanced sound can be provided at a flick of a switch for new audiences. But more importantly, the sound of existing acoustically 'problematic' halls such as London's Barbican and Festival Halls can be beneficially enhanced at a minute fraction of the cost of the new breed of designer concert halls. Which, with London's new Simon Rattle Hall still being debated and the 'acoustically perfect' Elbphilharmonie currently experiencing an emperor's new clothes moment, is not something to be overlooked. Image credit was Soumyasch via Wikipedia. New Overgrown Path posts are available via RSS/email by entering your email address in the right-hand sidebar. Any copyrighted material is included for critical analysis, and will be removed at the request of copyright owner(s). I know where you wanted to go with this, but the basis of comparing games to music/streaming doesn't seem to understand the moneys involved. Video games aren't "fixed" anymore. It isn't like the old days where you bought a cartridge or a floppy (or later a dvd-rom) and played 'til you were bored with it. There are a lot of ways to pay for bonus items or new levels or interactive play time that continue to keep money flowing. By contrast, the money feed *stopped* in music and video: on demand streaming at a fixed rate has, like mobile phone contracts and long distance calls (in America and Canada at least), frozen the revenue stream for many releases, especially the back catalog. When there is fixed revenue, there are no spikes and few incentives or even means to increase that revenue except by charging more per month (something Netflix does, and it makes the headlines every time they do it). With that is the 'cut' that the streaming service (Netflix, Amazon, Hulu, now IMDB has joined that market, Google and iTunes for music) takes that may not be included in that figure, which means the numbers you see are just what the studios see, not what is actually spent. Now I won't argue that spatial sound is a major thing, and I personally am annoyed as my SACD player busted, and they don't make cheap ones anymore (I paid $200 for my Sony years ago...currently I see new SACD players priced as high as $10,000???? - players that are cheaper don't support the 5.1, because of patent costs, which defeats the whole point of having the player). My collection of LSO-Live and San Francisco Symphony SACDs are almost useless. But DVD-A and 5.1 never really caught on: if you're going to be in your living room where you have the 5.1 set-up, usually you'll put on a movie instead. 5.1 mixing is also not necessarily easy to get 'right', and I'm not sure we've as a culture have decided what it should be. MTT did have an interesting mix for the DVD of Appalacian Spring for his Keeping Score: the mix had the "mic" in the middle of the chamber group playing the piece so you had different instrument colors in every direction. Joe, as usual, you make good points which lead us to think even further outside the box. Is there not an opportunity for classical music to move to a 'non-fixed' model? One obvious suggestion linked to this post is to offer alternative mixes - proscenium arch stereo or surround. (BBC Radio 3 has been experimenting quietly with alternative binaural streams of concerts - https://www.bbc.co.uk/programmes/articles/29L27gMX0x5YZxkSbHchstD/radio-3-in-binaural-sound). The Neu Ramón Humet CD cited in the post offers high resolution and 5.1 file downloads as a bonus. Exploring the 'non-fixed' route is even possible in the concert hall. In an earlier post I made the heretical suggestion of taking the sound from on-stage microphones and offering it in a surround mix to the audience using Bluetooth. In a concert hall equipped with HRTF sound-shaping the same concert could be given twice: once with traditional' sound, then with enhanced spatial sound. One important and overlooked point is that the sound of classical music itself is not fixed. The physiognomy of the human ear is unique to each person - no pair of ears are the same. So the HRTF effect means we all hear classical music differently. So 'non-fixed' solutions are just a reflection of reality. Trying to fix the sound to a 19th century sonic convention is not. As ever your contribution is appreciated. Not a technical point but not entirely tangential, either, I do remember in the late 90s hearing bemused electronica guys wonder at the very flat sound of 'classical' orchestras. They were genuinely concerned at the 'poor recording quality' of the music they were listening to. Mark, were they wrong? Or were their expectations simply different to more seasoned classical listeners? It's worth remembering that many experienced classical listeners conditioned by classical/romantic orchestras find the sound of period instrument ensembles unacceptably 'thin'. Again different expectations. As above, we all hear classical music differently. Quantum theory tells us that by the very act of watching, the observer affects the observed reality. So, by the very act of listening, the listener affects the observed sound. There is no 'right' classical sound. Just a plethora of different expectations. When I was studying architecture at the AA in the late 1960s my final 5th year thesis was a sound space synthesizer which was simply a geodesic dome with multiple speakers attached to the structure with studio quality sound, manipulated from live microphones or recorded music. In theory it could create any acoustic space, and could project any kind of music whether live or recorded. Unlimited possibilities in 3D. It wasn’t built but was all technically possible even before computers. It all arose from the frustrations of playing live music in terrible environments. Strangely the best acoustic environment we (it was a low volume rock band) ever performed in was the Queen Elizabeth Hall, a super sensitive natural acoustic environment. I think we were always looking, but never found, the perfect acoustic performance situation. One observation which relates to this post was that we as humans appear to be able to hear everything as if we were inside a 360 degree bubble - from all six quadrants. Our binaural ear arrangement let’s in sound but I’m certain that we have a much deeper center of consciousness that actually hears from all directions - below as well as above. I can’t prove it but I’ve observed it many times. On reflection, I think looking for a perfect acoustic space is like a bunch of grapes forever out of reach as we all quickly grow accustomed to whatever ideal musical space we can conjour. My late mother told me of how one of the most beautiful music experiences she ever had was hearing the Moonlight sonata coming out of a crystal radio set in a garden sometime before the First World War.